Gorinchem, the Netherlands - Canyon is happy to introduce netbook bags to its portfolio! Both the CNR-NB15 and the CNR-NB16 offer a lightweight and slim design, and are ideal for netbooks and other small-sized notebooks of up to 12”. These bags combine the practicality and durability of a traditional briefcase with the trendy look of messenger bags. They have two main compartments and additional pockets for all your things. These bags also feature a padded protective sleeve for a netbook, an adjustable shoulder strap and comfortable handles. The CNR-NB15 comes in black and orange, while the CNR-NB16 is available in black with green detailing. 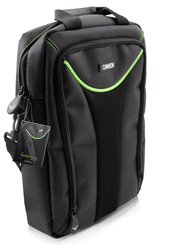 To see all bags in Canyon's portfolio, click here!